We discussed few topics like ‘What is Leadership?‘ and ‘Situational Leadership‘. Research on Leadership style model are usually based on orientation between Task behavior & Human Relationship behavior. 1. 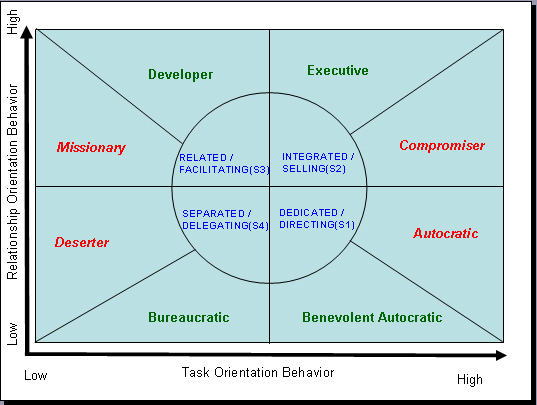 High relationship orientation & high task orientation is called as INTEGRATED TYPE. 2. High relationship orientation & low task orientation is called as RELATED TYPE. 3. Low relationship orientation & high task orientation is called as DEDICATED TYPE. 4. Low relationship orientation & low task orientation is called as SEPARATED TYPE. The below table shows the Less Effective & More Effective Leadership styles in each basic types. Even we can map the H&B Situational Leadership styles (Telling, Selling, Facilitating & Delegating) to Reddin 3D Theory model. This is essentially a hand-off or laisser-faire approach : avoidance of any involvement or intervention which would upset the status; assuming a neutral attitude toward what is going on during the day; looking the other way to avoid enforcing rules; keeping out of the way of both supervisors and subordinates; avoidance of change and planning. The activities undertaken (or initiated) by managers who use this approach tend to be defensive in nature. People who achieve high scores may be adverse to managerial tasks or may have begun to lose interest in such tasks. This does not necessarily mean they are bad managers; they just try to maintain the status quo and avoid “rocking the boat”. This is a legalistic and procedural approach: adherence to rules and procedures; acceptance of hierarchy of authority; preference of formal channels of communication. High scorers tend to be systematic. They function at their best in well structured situations where policies are clear, roles are well defined and criteria of performance are objective and universally applied. Because they insist on rational systems, these managers may be seen as autocratic, rigid or fussy. Because of their dependence on rules and procedures, they are hardly distinguished from autocratic managers. This is an affective (supportive) approach. It emphasizes congeniality and positive climate in the work place. High scorers are sensitive to subordinates’ personal needs and concerns. They try to keep people happy by giving the most they can. Supportive behavior represents the positive component of this style. It has, however, a defensive counterpart. They may avoid or smooth over conflict, feel uncomfortable enforcing controls and find difficulty denying requests or making candid appraisals. This is the objective counterpart of the missionary style. Objective in a sense that concern for people is expressed professionally: subordinates are allowed to participate in decision making and are given opportunities to express their views and to develop their potential. Their contribution is recognized and attention is given to their development. High scorers are likely to have optimistic beliefs about people wanting to work and produce. Their approach to subordinates is collegial: they like to share their knowledge and expertise with their subordinates and take pride in discovering and promoting talent. This is a directive and controlling approach. Concern for production and output outweighs the concern for workers and their relationship. Managers who score high tend to be formal. They assign tasks to subordinates and watch implementation closely. Errors are not tolerated, and deviation from stated objectives or directives is forbidden. They make unilateral decisions and feel no need to explain or justify them. They minimize interaction with people, or limit communication to the essential demand of the task at hand. They believe in individual responsibility and consider group meetings a waste of time. They tend to be formal, straightforward and critical. For that reason, they are likely to be perceived as cold and arbitrary, particularly by subordinates who have strong need for support and reassurance. This is the communicative counterpart of the autocratic style. It is still directive and interventionist. High scorers are seen as task masters who devote themselves comfortably to the accomplishment of production objectives. They enjoy tackling operational problems and may have less patience dealing with problems of human relation. They keep in touch with subordinates, instructing them, answering their questions and helping them with operational problems. They structure daily work, set objectives give orders or delegate with firm accountability. They would not hesitate to discipline or reprimand, but do that fairly and without antagonizing their subordinates. They meet group needs but ignore one-to-one personal relationship. Express appreciation of both human relations orientation and task orientation. They however admit to difficulties in integrating them. Therefore they may vacillate between task requirements and demand for human relations. In order to alleviate immediate pressures, they may resort to compromise solutions or expediency. They may be sensitive to reality considerations which stand in the way, and willing to delay action for whatever reason, internal or external. Their realistic assessment of situations may explain why they do not use freely the approach they actually prefer, that is, the Executive approach. This approach integrates task orientation and human relations orientation in response to realistic demand. It is best described as consultative, interactive, and problem solving approach. This approach is called for in managing operations which require exploration of alternative solutions, pooling different resources, and integrating opposing perspectives. They favor a team approach in problem solving, planning and decision making. They stimulate communication among subordinates, thus obtain collective ideas and suggestions. Managers who use this approach are usually perceived as good motivators who tend to deal openly with conflict and who try to obtain collective commitment. There is a time and place for all of the leadership styles. If a leader has one tactic that he or she relies on almost all the time, it is almost certain to develop into a pattern or behavior, in other words a style. 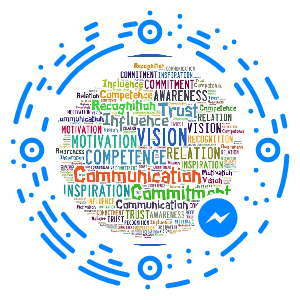 This entry was posted in Leadership, Situational Leadership and tagged Leader, Leadership, Leadership Qualities, Leadership Style, Managerial Effectiveness, Situational Leadership. Bookmark the permalink. ← Portfolio Management, Program Management and Project Management – How are they related? Really appreciate for introducing this model. Leaders should really apply different styles depending on what the situation calls for and on the king of people he is leading. There is no one proven effective styles, and most effective leaders know this. Impressive!. Thank you for these detailed and very informative discussion on different leadership styles. I personally believe that to be a great leader, one must not stick to only one leadership styles. A great leader knows what leadership style to use, depending on what a given circumstance, situation and what kind of people to govern. The key to effective leadership is flexibility and adaptability to different situations. you think .. What is he leadership’s features ? Fabulous explanation of leadership styles. thank you very much for providing such an informative material. Whenever you give negative feedback, support it with concrete evidence. explain the objective supportive reasons why this is important. H! It’s a big help for me..I just want to ask, how effective management could be achieved? Thank you! Hi nina, thanks for visiting the blog. Effective management depends on how well you’re applying the principles that you learned appropriately. In many situations the way I perceive the issue has major impact on the solution I take. Effectiveness of the solution depends on clarity of facts and support. Is this the website of the original leadership modelleadership model? Hi Tim, I don’t have any authentic information about the site you are referring. I browsed through some information on the website & it seems to be the author of this leadership model. Thanks for pointing me a good website. First of all thank you for pasting this great paper on leadership styles. I always though leadership is how one manages other people, but after ready this paper I realize leadership can mean so much than just managing. As a leader I am going to referre to this paper In the feature for guidence. Again thank you for pasting this paper. “managerial effectiveness is the extent to which a manager achieves the output requirements of his/her position.” He then goes on and say that that is the job of a manager; its his/her only job. I met Bill Reddin in 1982 and was most impressed with his MPASS and SPASS questionnaires. Thanksso much for this article. i’ve spent the whole afternoon searching for Reddin’s. Finally, i found it. God bless u, folks. Many. many thanks and more power. I have put all those into practice & got the result after few months. This is what i have been looking for, mmmmmm what a good explanation given here. I am an HR student and i hope to be a better manager just by applying all what i have read here and that changing of leaderships styles in order to be effective should not cause me a big headache. Nice description, now just got to get people to put it into practice and stop taking shortcuts. While leadership is often thought of a vague subject, it’s really a lifelong journey of self-improvement in the area of leading teams to achieving your goals. we can all improve our leadership through the study of the principles and some self-awareness and the willingness to apply these ideas in our teams.